Just a brief announcement for today. We’ll return to our more typical discussion material on Friday. My new book Cost Accounting Made Simple is available on Amazon. 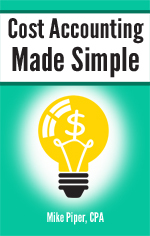 The book is meant to serve as a followup to Accounting Made Simple, which has been my best-selling book over the last several years. The print version is temporarily on sale for 50% off the normal list price (i.e., just $7.50 rather than the usual $15). Cost accounting is the process of measuring how much it costs a business to supply customers with the goods or services that it sells. Cost accounting is important because it provides business owners/managers with information that is critical to running the business. For example, if a business doesn’t know how much it costs to produce each of its products, it will make poor decisions about how much to charge for them. Similarly, if a business has inaccurate information about how much it is spending to run one of its divisions, it may continue running that division for years, losing money the whole time without even realizing it. The opposite problem can occur as well. For example, if costs are inappropriately allocated to a given product line, the business may incorrectly think that the product line is unprofitable (and choose to shut it down) when the division is actually earning a net profit for the company. Cost accounting is also useful for finding the source of a problem. For example, if a business reaches all of its sales goals, but still has a less profitable month than it had anticipated, cost accounting provides the tools to figure out exactly which costs were higher than anticipated. How to use activity-based costing to allocate costs.